Fun and colorful pink star light up Pasties. 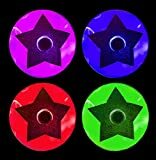 Pink Stars with multi color flashing lights. Great for burlesque shows/performances, raves, burning man, mardi gras, fantasy fest, costume, bachelorette parties/gifts, novelty gift, bedroom, or just for fun! -You can also where them under a shirt and the super bright LED's will shine through. -LED light that twist on/off, even while wearing -Batteries included and lasts over 20 hours if left on. -LED's have replaceable batteries for extended life! -Attach to the outside of a bra to make an instant Light Up Rave bra. -Perfect for festivals like Burning Man, Mardi Gras, Ultra Music Festival, and Fantasy Fest Light Up Pasties are PATENT PENDING! Other shops have already started to copy my idea and design, so I please ask that you buy from me to show your support of my original design. Check out this video of my light up pasties in action. youtu.be/Ct3njQCbhig Here's a behind the scenes photo shoot...vimeo . com/77101319 MAKE A STATEMENT WITH YOUR LIGHT UP PASTIES!